I am a prairie woman. I like my land flat. I like my horizons endless. I like my skies expansive. I grumble mightily when my easy, smooth path hits an incline. I huff and I puff when faced with a hill. I don`t understand why anyone would pay good money for a torture exercise machine that replicates the experience. I am also a novice runner. I began a running program at the end of this summer; a perfect time of year. The weather was gorgeous. The paths turned from summer splendor to autumn glory. I began to feel fit, and almost reached that stage of getting a mini-high. By October I had reached the goal of running non-stop for 30 minutes. Wahoo! But now, winter has arrived. Determined not to buy the torture tread-mill machine, I have vowed to continue running outdoors. But, I wasn`t prepared for the physiological changes of cold-weather running. When the temperatures dip, so does your energy level. Your legs feel like lead. The harsh winds bite at your face, and your lungs don`t know what hit them. And then there`s the path. 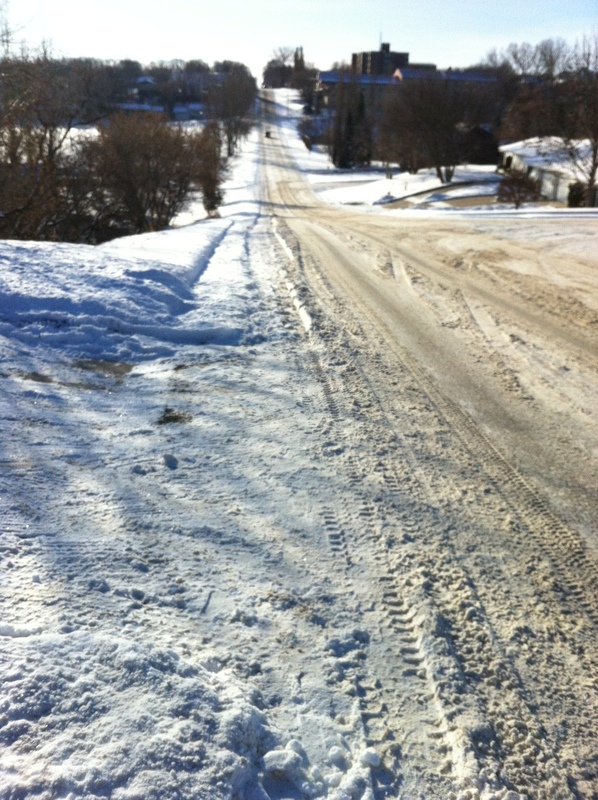 Gone are the smooth roads of summer; replaced by a sloppy mess of heavy snow and sand. Today, stretches of frozen humps point accusatory fingers at the lack of proper snow removal during last week`s warm spell. I tried on a new pair of ice and snow grips on my runners. They were brilliant; until they fell off during my first circuit around the park. Hmmm…it`s December 6th. How many more sleeps until spring? Advent is a time of wishful thinking and dreaming with the prophet Isaiah. It is a time of waiting and yearning for a time of overflowing banquets, peace-filled lands, and rough places turning to plains. A lumpy jogging path is merely an annoyance. What about the real barriers and obstacles in my life, and in the lives of those around me? What can I, what can we do to help remove them? What good can we do to fill the valleys of need? What actions can we take to tear down the mountains of hatred, poverty, and injustice? I enjoyed your words…”how many sleeps until spring?” We us the same word (sleeps) when we are counting down to an event. Once I heard someone say, “if we all placed our hardships, obstacles and mishaps all in a huge pile, we would take back our own.” I often think about that when I lfind myself gazing down at my navel and not out to the rest of the world. I know I worry less when I stop to count my blessings. Thank you for your “highway” message, Isabella. Worrying less and counting our blessings…a wonderful goal for all of us. Thank you, Chris!